It’s been 20 years since Starship Troopers hit theatres, wowing fans with its unique brand of over-the-top machismo spewing heroics and stomach-turning alien attacks. 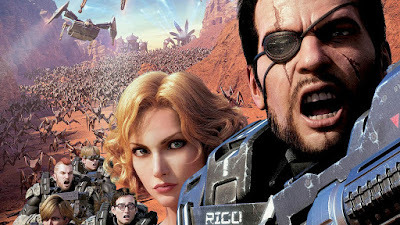 A series of live-action and animated sequels followed to various success, with this year’s Starship Troopers: Traitor of Mars being the fifth installment in the franchise. Fans of the ridiculous violence that helped establish the franchise will not be disappointed by this entry, as it was just as intense and visually stunning as its predecessor, something more impressive given the lack of live action set pieces. The battle scenes were at times generally enthralling, and the gore felt as visceral as anything that could come from the makeup department; expect decapitations, explosions and mutilations aplenty. Much like the original Starship Troopers, this installment is not without its flaws, and boy does it have a few. The voice acting is hammy-er than a cheap Christmas dinner, which in of itself isn’t a huge issue (indeed, it’s what made our favourite 80s action flicks so endearing), but the characters are also guilty of being entirely forgettable. Just like celery is little more than a vessel for mayonnaise, the dialogue was little more than a necessary evil to progress to more action. Again, this isn’t necessarily a bad thing, but makes you wonder how brilliant this film could’ve been with a better script. Starship Troopers: Traitor of Mars was much better than it had any right to be, with all the enjoyable, dumb fun you’d hope from the franchise. It’s the perfect film to make a drinking game of, set logic to one side and revel in some explosive, schlocky fun. If you’re not a fan of the series, this won’t be for you, however if you’re a certified bug hunter, you’ll find it to be superior to the live action sequels. The trailer is a good teaser for the movie and let me with a lot of curiosity. I watched the original movie when it first came out and it blew my mind. Never heard about the name of the movie after that and times passed by i grew up and became a writer for essay champ services and now i saw this trailer of an animated version of SST. The end tease of Rico was what made me want to watch this one as well.